Kimchi is a no waste food product that works great as an ingredient to use whenever you’re ready to move the food in your fridge. 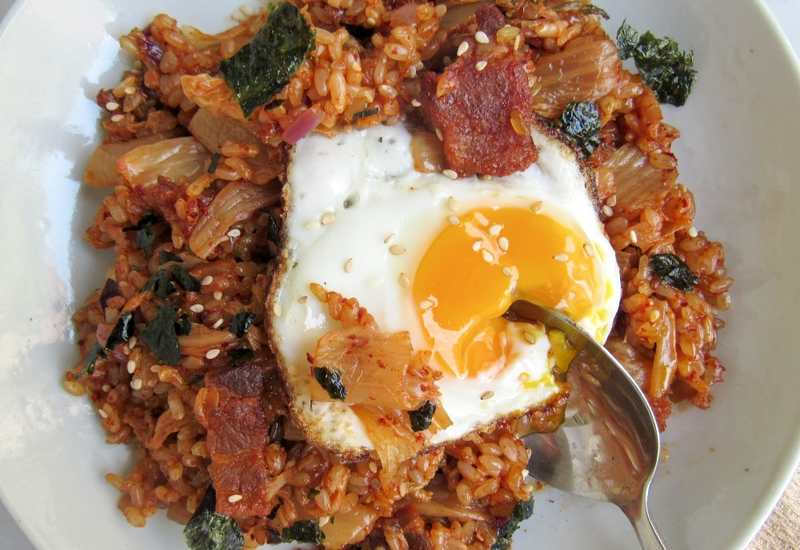 Use that last bit you have left by stirring it into a fast kimchi fried rice. Using pork belly gives this version of fried rice a richness that is unmistakable! Also the addition of crumbled nori seaweed sheets not only imparts incredible flavor, but it adds a light and fun crunch into every bite! Vegetarian? Get vegan kimchi. Use 1/2 cup of scallion, both white and green parts, instead of pork belly. Scallion, especially its white part, has lots of flavor that works great as a base for vegetarian cooking. Per Serving: 510 calories; 24g fat; 54.7g carbohydrates; 20g protein; 210mg cholesterol; 456mg sodium. I'm really starting to get into kimchi more and this is one of the recipes why. The hit of spicy with the sour is such a great combo. Also everything is better is bacon (pork belly). The fried egg on top rounded it out with a nice creamy yolk coating the rice. I'm kinda in love with this dish. I really loved this recipe, it was very filling. The fried egg on top is a must! There are so many flavors and textures going on in this dish, it's definitely mouthwatering. I basically throw kimchi on everything, so this was certainly no exception. Very good! I made this recipe using homemade kimchi, it was amazing with the fried rice. I wasn't able to find "toasted" nori seaweed, so I used regular nori and crumbled it up. Super tasty. Tried the recipe sans pork belly and now I'm obsessed. Added diced scallions for garnish. The recipe didn't call for an egg, but I added one anyway because the pictured looked amazing. I love this recipe overall. Used thick sliced bacon instead of pork belly, and it was so good. Addicting recipe, salty (in a good way), and full of flavor.